Cloudy with periods of rain. Thunder possible. Low 48F. Winds NNW at 10 to 20 mph. Chance of rain 100%..
Cloudy with periods of rain. Thunder possible. Low 48F. Winds NNW at 10 to 20 mph. Chance of rain 100%. After nearly 40 years serving as silent sentinel at the Montana National Guard Armory on Reserve Street in Missoula, the World War II vintage M7 howitzer is finally able to stand down. 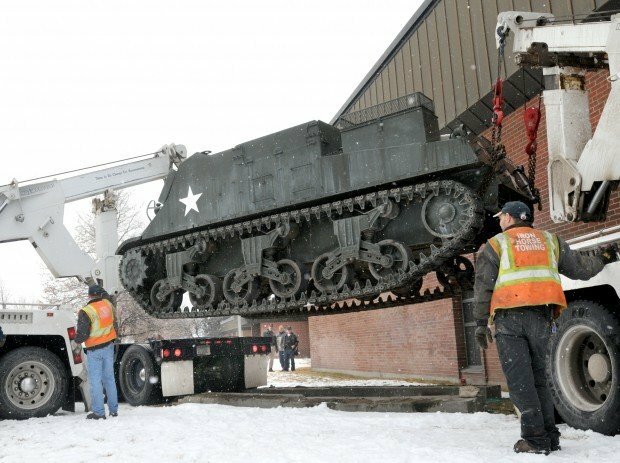 But moving the 26-ton artillery piece to its new home at Fort Missoula was no easy task. Scott Wolff, owner of Iron Horse Towing and Repair in Missoula, tried to move the tank with a 50-ton tow truck, but couldn't muster the needed traction to budge the monster. Plan B was to bring in another 30-ton tow truck, using both wreckers to lift the M7 high enough off the ground to drive a flatbed under it. Plan B worked. 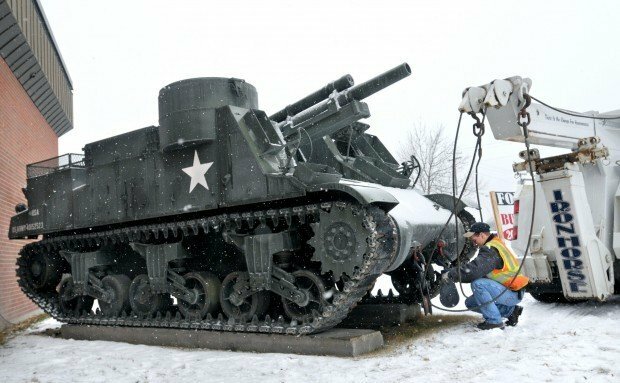 Thanks to Wolff, who donated his time and equipment, the tank now rests in front of the Rocky Mountain Museum of Military History at Fort Missoula. "I bet I shot $5,000 worth of ammunition through that howitzer," said Jerry Kurzenbaum, who dropped by the armory Tuesday morning to watch the move. Kurzenbaum was a forward observer with the 443rd Field Artillery Unit and remembers issuing firing orders to the M7's crew on training missions back in the 1950s. "It's powered by a 3,600-horsepower radial aircraft engine," Kurzenbaum said. "The transmission takes 52 quarts of oil." The British purchased more than 5,000 M7s during WWII and soon nicknamed it the "Priest," after its pulpit-shaped machine-gun turret. Built in 1944, this M7 spent most of its history with the Montana National Guard's 443rd Artillery Unit. According to retired Brig. Gen. Bo Foster of Missoula, the 443rd Artillery Unit had six to eight of the newly minted M7s. "We took them all over Montana to train," remembers Foster, who served as the first commander of the unit. "We even drove them to Boise. We used the barrow pits and some trails. We didn't think they would make the trip, but they did. They turned out to be pretty fine machines. We're sure glad to have one back in front of the museum." The Montana National Guard in Missoula will be moving to its new location at Highway 93 North near the Wye sometime in June or July, according to Sgt. 1st Class Bryan Fulcher with the Montana National Guard.